Albumen print by A Gardner from a negative by Timothy H O'Sullivan, from the album asembled by John Downes Rochfort. 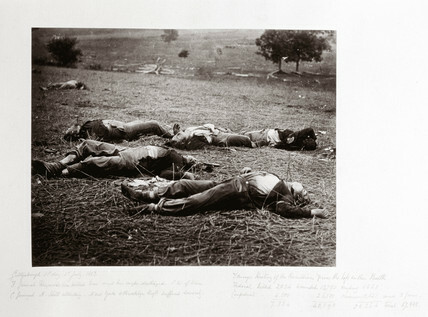 Rochfort visited all the major American Civil War sites in 1867 and some of the photographs he purchased en route have since become some of that war's best known images. Up to this time war had been portrayed as a series of heroic tableaux; these photographs revealed its realities for the first time. Gettysburg was the decisive battle of the war. General Robert E Lee's Confederate army fought the Union army of the Potomac under General Meade for the first three days of July 1863. The Union army lost 23,000 men, General John F Reynolds among them, and the Confederates 25,000, marking the end of Lee's planned invasion of the north. Confederate 'Quaker guns', Centreville, Virginia, USA, March 1862. A military bridge over the Chickahominy, Virginia, USA, c 1862. Home of a rebel sharpshooter, Gettysburg, Pennsylvania, July, 1863.